Yesterday afternoon, needing some exercise and fresh air having spent Saturday indoors, I walked around the neighbourhood surrounding Patterson Station in Burnaby as part of the recommended walks in SkyTrain Explorer by John Atkin. Getting there by bike instead of SkyTrain was the main difference from the others I've taken, cycling down Gilmore, the Sea-to-River Bikeway leading along Patterson, it turns out, right to my destination. I locked my bike up at the station and proceeded on foot, with my GlobalSat DG-100 GPS logger in hand, taking photos with my RebelXTi. You can see the set in Flickr, as well as the map made out in Yahoo! Maps (zoom in a couple of times to see in more detail where I took the photos). I also mapped the walk out in Google Maps, since Atkin's directions were a little confusing initially. A couple of other notes: the switch to daylight savings time made for some mislocated photos. I'm not sure if it was the camera or the GPS unit which had the hour ahead, and luckily GPSPhotoLinker has a button to view where individual photos fit on the map, aiding in discovering this fact. God may strike me down for this, but I manually edited the GPX file that the DG-100 exports via its Windows-only utility, moving all the hours (all in GMT) back one hour. The map on Flickr is a fairly good representation of the houses in the neighbourhood appear. 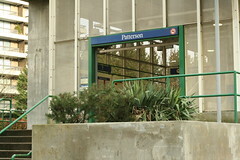 Some discoveries: Patterson has two entrances, which I didn't know until visiting it. One closer to Burnaby's Central Park, and one above the bus loop. Also, I'm pretty sure that the house 5575 Jersey I photographed is not the same 5575 Jersey that Atkin mentions in his book. He says it's “a fabulous house which is almost lost from view because of the overgrowth of vegetation around it.” Either someone removed the vegetation or someone removed the house. Needing a short break biking back home, and to make it officially an exploration worthy of the book's name, I hopped on a SkyTrain for one stop from Gilmore Station to Brentwood Town Centre Station.